One of the principal differences between the habits of this and some other species, which are now called Vireos, and the Flycatchers, is, that the former procure their food principally by moving about, and along the branches or the twigs of the trees, by light hops, alternately changing sides, reaching and securing their prey by an elastic extension of the legs and neck, without the continual snapping or clicking of the bill so common among the Muscicapae on such occasions, and that they seldom make sorties on the wing to any distance, for the purpose of seizing the insects on which they usually feed. This habit is retained until autumn, when, insects being scarce, the Vireo sallies forth to a short distance in pursuit of them, as they may chance to pass near the tree on which, in the silent mood of a Flycatcher, it stands erect, using the watchful side-glances peculiar to its tribe, as it anxiously expects the passage of its prey. Another difference is, that Vireos are generally more musical, lively and gay, than Flycatchers, so that their society is more welcome to man; and, as if fully conscious of their superiority in this respect, and knowing that they commit no depredations upon his fruit or bees, calculated to arouse his anger, they often suffer him to approach with a carelessness that evidently proves the simplicity of their nature. 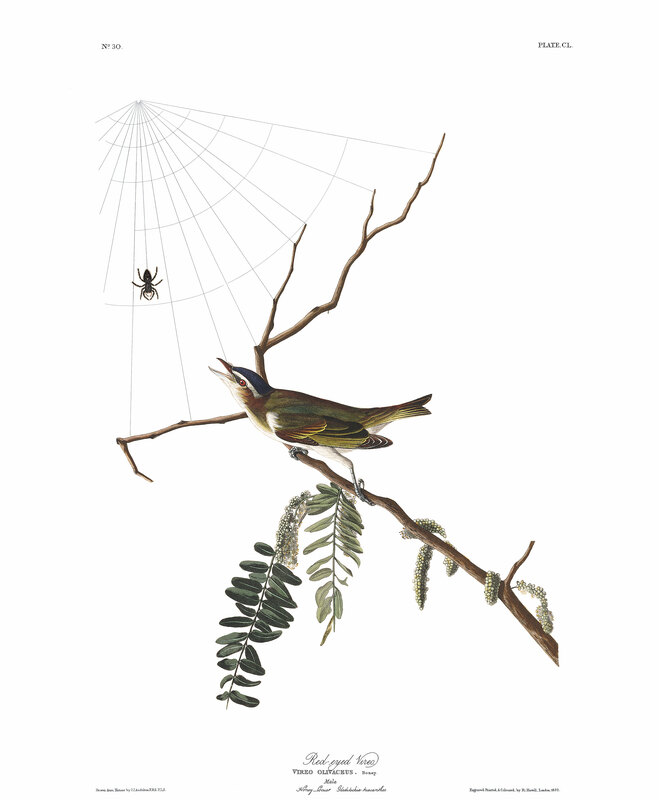 The third great difference between the Vireos and Flycatchers is, that the former seldom, if ever, go down from the trees to the water, for the purpose of drinking; while the latter are often seen gliding closely over rivers and pools, from which they sip their drink. The Vireos quench their thirst with the drops of dew or rain that adhere to the leaves or twigs. I might add, that the quivering motions of the wings in Flycatchers when alighted, is not exhibited by the Vireos, at least has never been observed by me. On the other hand, the affinity existing between the Vireos and Muscicapae is indicated by their being equally possessed of the power of regurgitation. The Red-eyed Vireo is an inhabitant of the whole of our forests. Now you hear its sweet, unaffected, musical, loud and free warble, from the inner top branches of a tall tree, for hours at a time, and even during the hottest part of the day; again, you may count each note that it utters, the little vocalist resting as it were to enjoy the sounds of its own music; next moment all seems hurry and bustle;--it raises its voice, and chants on with great volubility, so loudly that one might think the little creature intent on drowning all other sounds. The darker the woods, the more cloudy the day, the more unremitting are its exertions. It is one of the earliest singers in spring, and among the latest in autumn. In the south-eastern parts of East Florida, where many spend the winter, I have heard its notes and those of the White-eyed Vireo, even at that season. In South Carolina, in the neighbourhood of Charleston, I have heard and seen it early in the month of February, when scarce a leaf was yet expanded. It is not seen in Louisiana until the beginning of March, and I am inclined to think that perhaps an equal number of these birds come to us from the West India Islands or from Mexico. Few birds seem to enjoy life more than this Vireo, for at almost every short cessation of its song, it is seen making a movement or two up or along a branch, searching with extreme diligence for food, peeping cautiously under the leaves, and examining each bud or blossom with a care peculiarly its own. It may be seen flying from one tree to another with indefatigable industry, and this not only from morning to night, but during the whole time of its stay with us. So abundant is this bird, and so prodigal of its song, that any one paying the least attention is sure to hear it either from the trees which embellish the streets of the villages and cities, or the gardens and woods. The principal notes resemble the syllables pewee, pea, sho-re, sheire, chew-ree piwit. They are, as I have said, clear, loud, and melodious. The flight of this bird is altogether performed in a gliding manner, and when it is engaged in pursuit of a rival or an enemy, it passes through the woods with remarkable swiftness. It is an affectionate parent, generally leading about its young, particularly its second brood; for it often breeds twice in the year, even in the State of Massachusetts, or far up on the Mississippi. On such occasions, the parents proceed through the woods with more care, and on the least appearance of danger utter a querulous note, the meaning of which is so well understood by the little family, that they seldom fail to hide or become mute in an instant. The young are fed for several weeks after they leave the nest, and, I believe, migrate with the old ones, for I have frequently seen them on the move until dusk, and going to roost together at nightfall. I do not recollect ever having seen one of them on the ground. Like the true Flycatchers, these birds eject small pellets formed of the hard crusts of the abdomen, legs, and other parts of insects. I have but very seldom seen them feeding on berries of any kind, although in Louisiana I have observed them pecking at ripe figs. The nest of the Red-eyed Vireo is small, and extremely neat. It is generally suspended, at a moderate height, from the slender twigs forming the fork at the end of a branch. I have found some situated so low that I could easily look into them, while others were hung thirty feet over head. Dogwood trees seem to be preferred by them, although I have found the nests on oaks, beeches, and sugar-maples, as well as on tall grasses. The male bird frequently leads you to the discovery of the nest, by its great anxiety about the safety of its mate. The outer parts are firmly attached to the twigs, the fibres being warped around them in various directions. The materials are usually the bark of the grape-vine, the silk of large cocoons, some lichens, particles of hornets' or wasps' nests, and decayed worm-eaten leaves. The lining, which is beautifully disposed, consists of fibrous roots, grasses, and now and then the hair of various quadrupeds, especially the grey squirrel and racoon. The nest, however, differs greatly in different latitudes; for, in the Middle States, they often use the leaves of the pine, cedar, and hemlock, which they glue together apparently with their saliva. The eggs are from four to six, pure white, sparingly spotted at the larger end with reddish-brown or blackish dots. They are laid in Pennsylvania about the first of June, and later in more northern parts. The eyes of the young are of an umber colour, and do not become red until the following spring. Those of some shot in the Floridas in January, had not changed their colour. In February I shot two, each of which had a red and a brown eye. This bird, as well as the White-eyed Vireo, is often called to nurse the young of the Cow-bird, which deposits its egg in the nests of either species, assured that it will be properly treated. No difference exists in the plumage, or even size of the sexes. It appears that an individual of this species was procured at Cumberland House, lat. 54 degrees N., and a description of it is given in the Fauna Boreali-Americana, but without a single word as to its times of appearance and departure. My friend Dr. THOMAS M. BREWER has sent me the following curious notice respecting this species. "There is connected with the egg of this bird which I sent you, a fact of some interest, both as displaying its kind nature, and as establishing a fact in natural history. Mr. ORD says, in his paper in LOUDON's Magazine, that 'it is probable, that if the Cow-bird deposits her egg in a nest wherein the owner has not yet begun to lay, the nest is either abandoned forthwith, or the egg of the intruder is buried by the addition of fresh materials, so that it becomes abortive!' Let us see if this be so. On the 10th of June, 1836, I found the nest of the Red-eyed Vireo nearly finished. It was situated on the extremity of a branch of an oak, at the height of about 30 feet. Being in that situation quite inaccessible, I fastened a cord to the end of the limb, and by bringing it closer to the body of the tree and securing it in that situation, I put it within reach. Although by this means the nest was nearly inverted, the bird did not forsake it, but built up the under side, and adapted it to its new situation. About a fortnight after, I found in the nest two eggs of the Cow Troopial advanced in incubation, although there were none of the eggs of the owner of the nest. On the 30th of the same month, the egg of the Vireo was found to have been added. This had been sat upon a few days; and those of the Troopial were nearly ready to be hatched. This fact is one of the most satisfactory kind, for not merely one, but actually two eggs of the Cow Blackbird were deposited, and instead of being forsaken were incubated for at least a week before the bird was ready to lay any of her eggs; and although repeatedly disturbed, first by having her empty and unfinished nest nearly inverted, then by having the eggs of the Cow-bird removed and afterwards replaced in order to put their identity beyond doubt, and again by having her own eggs removed, she still clung to her adopted younglings with unexampled fidelity." RED-EYED FLYCATCHER, Muscicapa olivacea, Wils. Amer. Orn., vol. ii. p. 55. VIREO OLIVACEUS, Bonap. Syn., p. 71. VIREO OLIVACEUS, Red-eyed Greenlet, Swains. and Rich. F. Bor. Amer.,vol. ii. p. 233. RED-EYED VIREO, Vireo olivaceus, Aud. Orn. Biog., vol. ii. p. 287; vol. v.p. 430. Bill of moderate length, strong, depressed at the base, compressed towards the end, somewhat ascending. Upper mandible with the dorsal line slightly convex, the sides convex, the edges sharp and notched towards the end, the tip acute and suddenly deflected; lower mandible with the dorsal line also slightly convex, the back rounded, the edges sharp and inflected, the tip acute. Nostrils basal, lateral, oblong. Head rather large, neck short, body rather robust. Feet of ordinary length; tarsus compressed, anteriorly scutellate, sharp behind; toes slender, free; claws arched, compressed, acute. Plumage soft and blended. Wings rather long, the second and third primaries longest; tail of ordinary length, slightly emarginate. Bristles at the base of the bill short. Bill brown above, pale bluish-grey beneath. Iris red. Feet bluish-grey. The general colour of the plumage above is light yellowish-olive, the crown of the head deep-grey, bordered on each side by a line of blackish, below which is a line of greyish-white passing from the nostril over the eye. Quills dusky, olivaceous on the outer margin, white on the inner. Tail wood-brown. The lower parts are white, the breast and sides tinged with pale yellow. Length 5 1/2 inches, extent of wings 9; bill along the back nearly 1/2, along the edge 8/12; tarsus 8/12. The female resembles the male, but is of a duller white beneath. From Texas to Nova Scotia, and through the interior. Accidental in the Fur Countries. Abundant. Migratory. GLEDITSCHIA TRIACANTHOS, Willd., Sp. Pl., vol. iv. P. 1097. Pursh, Flor. Amer. Sept., vol. i. p. 221.--POLYGAMIA DIOECIA, Linn.--LEGUMINOSAE, Juss.